MU SSON is one of a handful of PhD programs in the U.S. open to nurses and non-nurses. The interprofessional aspect of our PhD program is made possible by the wide range of academic backgrounds our MU SSON faculty have and well as our strong, interdisciplinary research connections across the campus including but not limited to biostatistics, education, family and community medicine, health informatics, human development and family science, journalism, public health, social work, and veterinary medicine. Applications for the PhD Program are due January 1 for early acceptance and March 1 for regular acceptance. All students begin coursework the summer following program acceptance and are required to attend the N7087 Leadership and Technology Institute On-Campus Days. 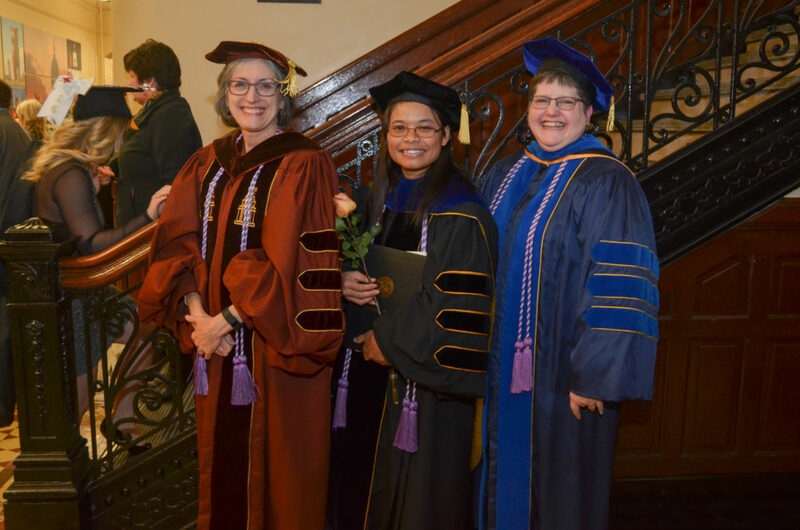 The PhD application is fully online via the MU Graduate Studies website. You will submit a fee to MU Graduate Studies when you apply. You will not send any items to the MU SSON at the time of application. Competitive applicants with a strong research mentor match are invited to participate in an interview. Applicants to the International Residential PhD Option are strongly encouraged to apply by the January 1st deadline to allow sufficient time for processing immigration paperwork. Early acceptance applicants are notified in the later part of February. Regular acceptance applicants are notified no later than mid-April. All new PhD cohorts start in the summer session. PhD applicants entering with a bachelor’s degree: Bachelor’s degree in nursing from NLNAC, ACEN, CNEA or CCNE-accredited school OR equivalent for non-nurse applicants; 3.3 minimum GPA (4.0 scale). Applicants who do not meet the minimum GPA requirements or do not have a cumulative GPA must submit acceptable scores on the Graduate Record Exam (GRE) and the exam must have been taken within the last five years. PhD applicants entering with a graduate degree: Master’s or doctoral degree in nursing from NLNAC, ACEN, CNEA or CCNE-accredited school OR equivalent for non-nurse applicants; minimum 3.5 GPA (4.0 scale). Three (3) professional recommendations – Describing professional competence, potential for success in the PhD program, and potential for making a contribution to nursing and/or health care. Ideally, two of these recommendations should be from PhD-prepared individuals. Personal statement of research goals and interests – Describes what you want to study, who you want to study with, and why you want to study at the Sinclair School of Nursing. Please make sure to identify at least two potential PhD-prepared faculty whose research expertise is consistent with your research interests. Note: As of April 2016, a graduate level statistics course is no longer required as a prerequisite for the PhD program. The MU SSON PhD program uses a comprehensive, holistic review process. In a holistic review process, we consider the applicant as a whole individual, not merely select parts, such as GPA or GRE test scores. In doing so, we evaluate applicants based on who will contribute to the MU SSON’s academic community in meaningful ways. Holistic review takes into account factors such as a research mentor match, academic and professional goals, student’s strength of undergraduate and graduate (if applicable) coursework, grade trends, special circumstances, and ability to enhance the diversity of the program. By evaluating the applicant from a holistic perspective, we take the time to get to know applicants as people, not as numbers.